It's been quite a while since I did a meal plan. Between the baby and moving and sleepless nights, I've been content to just throw something on the table at night and call it a success. But, with things finally starting to settle down, I've made it a goal to get back in the swing of things. Life is so much easier when I plan for the week, and I can make better use of my time during the day when I know what I'll serve at dinner. I'm still on a plan of cooking about 4-5 dinners a week. I don't cook every night and I'm ok with that. Eating well doesn't mean you have to have something hot or something new each night. If you're new to meal planning, set realistic goals and take baby steps. That evening, I also cooked a Spaghetti Squash and Butternut Squash. The SS was for meals later in the week, and the BS I mashed and froze in an ice cube tray. I did use it in some homemade soup this week also. Beet Cookies??? Yes , Please! How do beet cookies sound??? Not so good? Well, the truth is that the beet taste is hidden and they come out this awesome shade of pink! They just taste like regular cookies and you’ll manage to sneak in some veggies along the way. I personally never bought a beet until this summer when I made a (failed) attempt at making beet chips. But, I heard that cookies were another way of eating beets so I thought I’d give it a try. 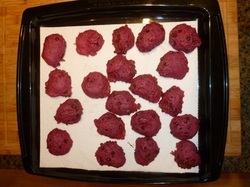 Beets don’t seem that appetizing to me, but cookies do! I didn’t find these cookies to be “knock your socks off” delicious, but they are certainly a worthwhile cookie. I don’t know about your kids, but as long as it’s a cookie they don’t care what’s in it or even what it tastes like, they just know they are getting a treat. So why not add a little beet to your cookies? It seems to me, much like pumpkin or applesauce, the beet is substituting for the egg. 1. Peel them raw (a little difficult), cut, and steam until soft (don’t use the water to puree, use fresh water instead). 2. Set oven to 350. Cut off stems, leaving a little attached to the beet. Wash, then put in baking dish with a little olive oil and salt. Cook for 50+ minutes, until toothpick comes out easy & clean. Cooking time will depend on the size. Mine cooked for nearly 80 minutes. Let cool, then peel (it sort of peels like a blanched tomato or peach would, but not quite as easy). Then, you’ll want to puree them using your method of choice. I chose cooking method #2 above and used a food processor to puree. I needed to add a couple tablespoons of water to get a puree. 1. I doubled the recipe, and used Enjoy Life chocolate chips in place of the chocolate chip rosting she used. 2. Also, I found the batter way too dry to make cookies. I ended up adding around 2 tablespoons of water to the batter. Whether or not you need to do this will probably depend on how much water you used to make the puree. 3. I also used half whole wheat flour and half regular flour. I find whenever I use whole wheat flour in a cookie recipe it does change the taste into a bit. You can just taste the flour a little more. But, it doesn’t bother anyone and it seems to make them a bit better for you so that’s why I do it. Good luck! If you try them let me know what you think! I also dehydrated 3 pounds of strawberries. I use these in homemade trail mix. The great thing about the dehydrator is the resulting fruit takes up very little space for storage. My 3 pounds shrunk down and only filled about half of a quart Ball jar. I froze about three pounds as well. Some Tips for shopping at BJ's Wholesale! "What are the guidelines for using more than one coupon? When purchasing a multi-pack of “individual for sale” packaged items, which is a set of items that could be sold individually (each item has a barcode) shrink-wrapped and sold together, Members can combine one BJ's-issued coupon with manufacturers' coupons. However, you cannot exceed the actual retail price in the total value of coupons. Members may also use one BJ's coupon and one manufacturer's coupon on a single item." This means that many items qualify for the use of multiple coupons. Some items I have used multiple coupons in the past for include: canned pineapple, canned tomatoes, juice boxes, baby food pouches, paper towels, tissue, sunblock, etc. If you can manage to buy these items when a BJ’s store coupon is also available you can really hit the jackpot! I don’t believe wholesale clubs are always a bargain. I keep a chart in a small notebook in my purse that lists prices for items that I can find at BJ’s and other stores. It lists the per unit best price so that I can know whether a sale with coupon at Target/Kroger or a coupon at BJ’s would provide the best price. Be sure for paper products to list out price per square foot, not price per roll. Every store has different size rolls, and the single/double/mega/huge roll nonsense can get annoying! Here’s how I saved $23.75 on my last trip using coupons. Some V8 Coupons are available on V8’s website here. I broke my foot this week, so needless to say I am not doing much cooking and I don't know when things will be returning back to normal! So, no meal plans for a while, but here are a couple new recipes I've made the past couple weeks and a couple old ones that are great for Christmas! Chocolate Sunbutter Cups -- These are like peanut butter cups except using sunbutter instead. They are perfect for gift baskets for teachers, friends, and neighbors. Sugar Cookies -- I use both a recipe and frosting recipe from The Food Allergy Mama's Baking Book. I can't reprint it here, but if you don't have access to the book there are lots of vegan sugar cookie recipes available online. I just wanted to remind you the option is available and is a great way for our kids with allergies to enjoy decorating cookies with friends. *Click here to visit my page on Facebook and "like" me to receive my blog posts automatically. *Click here to view my Affiliate Disclosure. We are pretty traditional when it comes to a Thanksgiving menu. I also prefer not to do too many complicated items. There's only so much room in the oven! This was a light week for meals. My husband was out of town for much of the week so I didn't cook as much as normal. This week I made two meals from The Welcoming Kitchen, a cookbook which contains 200 recipes that are free from all 8 major allergens and are also vegan. Because these recipes are not online, I cannot link to them or reprint them here. At only $12 it is a reasonable price, or you can try to check out the book from your local library. I'll be posting several items soon that I've tried so you can get an idea whether the book it is a good option for you. The grown-ups didn't eat dinner, but both the kids had sunbutter and banana (I slice up bananas and spread a little Sunbutter on top of each slice...top it off with a raisin if you want!) and they split an avocado. Lasagna from The Welcoming Kitchen. I was pretty excited to find this tofu-free recipe. It is also free from any non-dairy cheeses. It uses an acorn squash/bean mixture along with some spices for the traditional cheese layer. I used my own Hidden Veggie Spaghetti Sauce for the sauce layer. This recipe was a winner all-around in my house. Both my kids loved it, and both my husband and I thought it was excellent. I can't remember for the life of me what we ate for dinner! It must not have been too exciting! I didn't cook a fresh meal that night so it must have been either yogurt or I may have pulled some food like soup from the freezer. Sloppy Joes from The Welcoming Kitchen. This recipe uses lentils in place of meat. I am new to cooking lentils and I think I cooked them a little too long. Regardless, this was a mixed success. I thought they tasted like sloppy joes, but the texture took some getting used to (though again, I think I overcooked them so this was part of the problem). My husband did not think they tasted like sloppy joes, and thought the texture was odd too, but he liked them! My son ate some and my daughter wouldn't even try a bite (she's still in a picky phase). I actually think this mixture would also be good mixed with rice, and also as a dip for tortilla chips. We ate out for lunch so the grown-ups had leftovers while the kids had yogurt, granola, and raisins. Chicken Burgers. These are a convenience food from the freezer section at BJ's wholesale. The brand is Harvastland and they carry one type of burger that is free from our allergens. This week we also made a batch of ice cream in our ice cream maker, Chocolate Chip Cookie Dough. The recipe is contained in Lick It so I cannot reprint it here, but we enjoyed it! You CAN save at Whole Foods! How I saved $14 using coupons! You can use one manufacturer coupon and one store coupon per item. Store coupons are available online or in a booklet available in-store. WF has a policy where you can only use one store coupon for an item at a time (you can’t print out 10 store coupons for the same item and use them all at once but you can use several store coupons at the same time for different items), but I have found my WF to be pretty flexible with this rule. However, I generally limit it to two so I don’t create too much drama. You’ll see this below with my gravy purchase. Don’t forget WF offers case discounts of 10% on yogurt. A case of So Delicious Coconut yogurt is 12, so that’s the amount we normally buy when we visit. WF issues new coupons before their prior ones have expired. Likewise, they remove coupons from their website even though they may not expire for another month. If there is a coupon available that you use, I suggest you print several because once they're gone, they're gone! You’ll see from my list below that some manufacturers coupons from Coupons.com are no longer available. When I post available coupons, print them right away because you never know how long they’ll be there. Organic coupons never last very long! Remember you can print 2 per computer. *A couple months ago I completed an online survey from the company and they sent me a free product coupon. Currently, you can click here to print a coupon for their products and be notified of any future surveys. Meals from the past week! We ordered pizza. I normally make my son his own pizza when we order in but he didn't want it and chose yogurt and grapefruit instead. If only I had the discipline to choose yogurt and grapefruit in place of pizza! Spaghetti (I used veggies I had on hand, which included a small zucchini, some frozen chopped peppers and onions, a small sweet potato, 3 carrots, 4 butternut squash cubes, 5 spinach cubes, as well as one can of red kidney beans and one can of great northern beans). I also got an itch to bake some bread this week in my breadmaker. I made whole wheat cinnamon raisin bread first. This was decent for a whole wheat recipe except next time I'm going to leave out the raisins. I really don't like raisins in baked goods! I also made a loaf of whole wheat zucchini herb bread. This recipe did not clarify to what extent I should drain the water from the zucchini and I clearly did not drain enough! While the dough was kneading I had to add probably about another 1/2 cup of flour to get the dough ball to the right texture. This led to the bread sinking on top and also a much denser loaf than I prefer. Next time I'm going to try the recipe again someday but make much more of an effort to squeeze the water out of the zucchini.